The first game of Bruce Arena’s second stint at the helm of the U.S. national team wasn’t very exciting and won’t be remembered by many who weren’t among the 20,000-plus in attendance at San Diego’s Qualcomm Stadium. But the 0-0 draw against Serbia may prove important, considering what’s just around the corner. Arena doesn’t have the luxury of easing into the job thanks to the USA’s 0-2-0 record in CONCACAF World Cup qualifying. He must identify a squad and system that will secure the necessary points against Honduras and Panama in March, and he’ll have only a few days to train his full team ahead of those two contests. So Arena has had to make the most of the three weeks he’s spent with his MLS-based group this month in California. Camp will conclude with next Friday's friendly against Jamaica in Chattanooga, Tennessee. And Arena will have to be running when he hits the ground in March. Missing its regulars based in Europe, the USA nevertheless featured several likely starters. And on Sunday, it probably should've defeated a junior varsity Serbian side composed almost entirely of SuperLiga players who came in with a combined six senior caps. But the tie wasn’t a total loss. Here are three thoughts from Arena’s second debut. January games often are sluggish or disjointed. It’s tough to replicate game intensity during practice sessions, no matter the commitment of the players. The vast majority of Arena’s men hadn’t played in more than two months. They'll be disappointed, but not surprised, that the precision was lacking against Serbia. Sunday’s friendly had its moments, but for the most part the proceedings were a bit pedestrian. If Arena was hoping to get his players used to a certain shape and a couple of specific patterns, then it was a decent exercise. Getting a look at Graham Zusi at right back, or seeing the likes of Sebastian Lletget and Darlington Nagbe play with energy and confidence, made the game worthwhile. It was a historic afternoon for Jozy Altidore, who became the 17th American man—and second-youngest—to earn 100 international caps. He’ll wish he had more to celebrate, however, following a 73-minute shift during which he didn’t get many looks at goal. And Sunday marked the first cap for Lletget, Chris Pontius and left back Jorge Villafaña, who’s had trouble breaking through at Santos Laguna. The Americans managed only one shot on target (from Altidore) and failed to establish the sort of quick interplay that might pull Serbia apart. Both teams had chances to score but both lacked the quality to do so (although the visitors were unlucky not to win a penalty kick after Greg Garza tripped up Jovan Djokic midway through the first half). And either team could have won it at the end. Nick Rimando, who may wind up starting in March because Tim Howard is still returning from surgery and Brad Guzan hasn’t been playing in England, made a point-blank save on Serbia’s Lazar Jovanovic in the 89th minute. Moments later, Pontius steered a shot with potential wide of the left post to cap his showing off the bench. It wasn’t much to watch, but in the end nobody will remember the score. What’s important is that Arena made progress toward identifying his team in March. With scant time to tinker before naming his qualifying roster, Arena had no choice but to use this camp for more than just offseason fitness and player identification. He had to come out of it with some answers, or least some strong leads, and before Sunday’s match the manager acknowledged, “I think what you see [tactically] in these next two games is what you’ll see in March. Among the national team’s most pressing issues—one Jurgen Klinsmann never managed to solve—was nailing down a consistent midfield alignment while figuring out to best deploy Michael Bradley and Jermaine Jones. In San Diego, Arena offered a couple of significant clues to how he’ll approach the qualifiers. Bradley played deep. Really deep. In fact, the captain frequently dropped between center backs Steve Birnbaum and Chad Marshall in order to handle distribution. That left Jones with the room to roam the veteran desires—Arena has been clear this month that the new LA Galaxy acquisition still has his legendary motor. Higher still was Sacha Kljestan, the runaway MLS assist leader who revitalized his international career last summer. Shortly after taking over, Arena said, “We need a better passer in the midfield than we have. We need to have a player in the attacking half of the field who can deliver the right ball at the right time.” Kljestan is the most likely candidate for that role, and Benny Feilhaber’s inclusion in January camp makes him a candidate as well. Feilhaber, who did so well as a reserve at the 2010 World Cup, relieved Kljestan in the 77th and made several nice plays. So, it appears Arena is leaning toward a 4-2-3-1/4-1-4-1, depending on how one classifies Jones (if that’s possible). Both Kljestan and Jones are leaving camp and returning to their clubs, Arena said after the game. Kljestan's wife reportedly is due to give birth. The midfield that started Sunday (which included Alejandro Bedoya and Nagbe in the wide positions) can’t go against Honduras in March, however, because Jones is suspended. The top candidate to replace him now appears to be a player who made his international debut on Sunday—the Galaxy’s Lletget. Arena obviously was familiar and comfortable with the player thanks to their time together in MLS, and Lletget, 24, had earned rave reviews from teammates through the three weeks of training in Carson. Arena sent Lletget on for Jones to start the second half and the former quickly had a positive impact, suggesting that he’ll almost certainly get another chance to stake his claim next Friday against Jamaica. Each winter, January camp sets a national team career or two in motion, from Pablo Mastroeni in 2002 to DeAndre Yedlin in 2014. Based on Sunday’s very early indication, Nagbe and Lletget may look back on this January camp as the point it all started for them. For Nagbe, of course, this was far from a first opportunity. 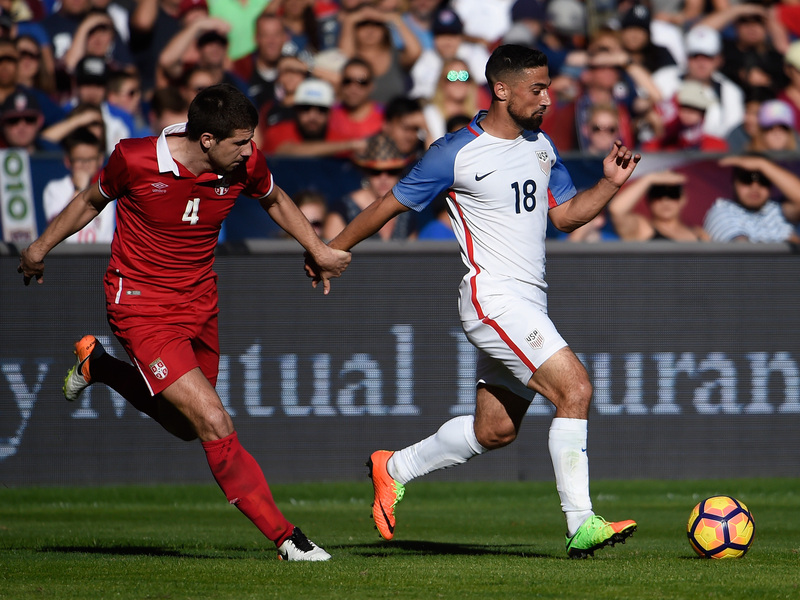 The Portland playmaker made his U.S. debut back in November 2015. But he never started for Klinsmann and after he rejected a call-up last fall, some wondered whether Nagbe’s international future was in doubt. But a new coach offered a clean slate, and then a start. And Nagbe made an impression with his second chance. After a quiet opening on Sunday, Nagbe—playing on the left—emerged as the USA’s most consistent attacking threat. His started to find the ball and his touch and creativity was key to the creation of a couple good chances against a very compact foe. In the 24th, he launched an attack with a strong run inside his own half. His pass to Kljestan put the U.S. in gear, and Nagbe was just a couple feet from Jones’s cross at the play’s conclusion. Five minutes later, Nagbe collected a pass, found a bit of room and then curled a shot just over the right corner. And then in the 38th, he ran onto feed from Jones, cut the ball back nicely and sent another shot wide. If Arena ever wants to press the attack, he could do worse than deploying Nagbe and Christian Pulisic on the flanks. As for Lletget, his combination of skill and strength was on display early. After only two minutes on the field, he worked hard to win the ball from two Serbian midfielders before finding an outlet, getting the ball back and then linking up with Bedoya on the right. That play ended with the Serbian goalie smothering a through ball to Altidore. In the 58th, Nagbe and Lletget hooked up, and the latter showed his versatility with a run to the left corner and a perfectly floated cross to Kljestan. Lletget’s late turnover resulted in the dangerous Serbian counterattack that was stifled by Rimando's save. But that’s a teaching moment, and one that’s far from a deal breaker for a player making his debut. Having players with that kind of skill and instinct to go forward will be vital if Arena sticks with something resembling the system he used Sunday, as Altidore is left without a partner up front. Arena was pleased with both players following the game.